GRAND RAPIDS, Mich. --A 100-year-old man represents an important time in America’s history. Virgil Westdale represents America’s success as a nation, and its failures. 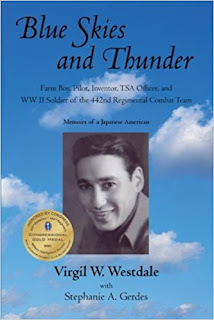 Westdale was stripped of his wings during World War II because of his family’s Japanese heritage. He is hoping to get them back at a ceremony Saturday at the Gerald R. Ford Presidential Museum honoring his 100th birthday. Westdale was one of five children born to his Japanese father and American mother in Indiana, and took up flying while in college in 1942. “The war was starting pretty heavy. Everybody was leaving, all the guys,” said Westdale, who signed on with the Army Air Corps as a flight trainer. He loved to fly, and he was good at it. He expected his skills as both a pilot and instructor would take him far with the Air Corps because of the war and demand for pilots. However, the attack on Pearl Harbor brought on paranoia to Japanese-Americans. While other Japanese-Americans were sent to internment camps, Westdale was stripped of his wings even though his father had been here 30 years and had an American mother. Westdale was then sent his new orders: becoming a part of the 442nd Regimental Combat Team, an Army fighting unit composed almost entirely of American soldiers of Japanese ancestry that took part in major battles from fighting Germans in Italy to liberating Dachau concentration camp in Germany. “It was the best outfit, as it turns out, in the whole army,” Westdale said. After the war, he came home, went back to college and made a career as a scientist with 25 patents to his credit. Twenty years after the Army took away his wings, Westdale’s boss told him a new project would require a government security clearance. Westdale didn’t think it would be possible. But times had changed, and he received the clearance. “Then, I knew that things had changed in America in 20 years,” Westdale said. He retired, but went back to work, spending 14 years as an airport security and a TSA Agent, retiring just nine years ago at the age of 91. Throughout his life, Westdale has received numerous honors both as a soldier and as a civilian. Despite what many would consider a slap in the face early on, he never lost his love of country and his sense of duty. He looks upon the return of the wings he was stripped of 75 years ago as he has all along. “Until I see it happen, well, we don’t worry about it,” he said.